What is it: Your secret weapon for the perfect head to toe skin-kissed glow this summer. 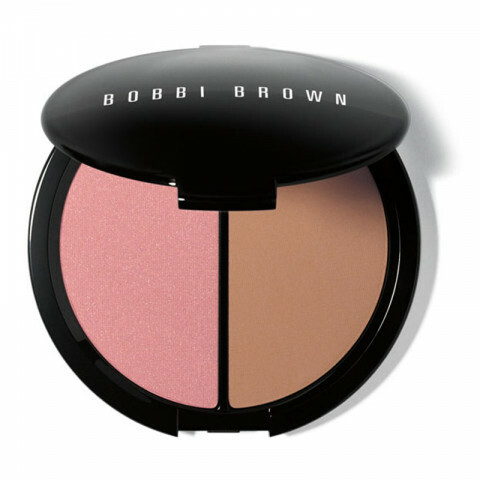 Bobbi's Face & Body Bronzing Duo combines Telluride Illuminating Bronzing Powder and Elvis Duran Bronzing Powder so you can custom-blend and build your bronze. These layerable shades are ideal for light to medium skin tones. Who is it for: Anyone who wants a natural-looking summer glow for both face and body. Why it's different: For the most natural-looking color, Bobbi layers a deeper shade of bronzer under a brighter "pop" shade. This palette combines both in a large, mirrored compact, so you can create a perfect sun-kissed look at home or on the go. How to Use: Using a Bronzer Brush, apply Elvis Duran Bronzing Powder starting on the apples of cheeks, blending up towards the hairline and down to soften color. Add a pop of Telluride Illuminating Bronzing Powder on the apples of cheeks. Sweep brush through both shades and dust on neck, shoulders and limbs for an all-over glow.